This week sees the return of LFW for a new season ahead, but as I will be checking out AW15 styles, the clothes for SS15 are hitting stores for this Spring. One major trend that was seen across the catwalks was seventies. This included flares, yes flares are back in a big way and I don’t just mean around your ankles. Look out for them in a variety of colours, in a trouser and most definitely wear them in a denim. Suede skirts and jackets are a key item and if in patchwork then even better. Pick up a suede trenchcoat as seen at Gucci, Mango currently have a fantastic copy. Bags take a bucket form and add some extra fringing, whilst blouses should most certainly have a pussybow. Trousers should be very high and jewellery stacked and colourful. Here are some of my favourite picks from designer to high-street. 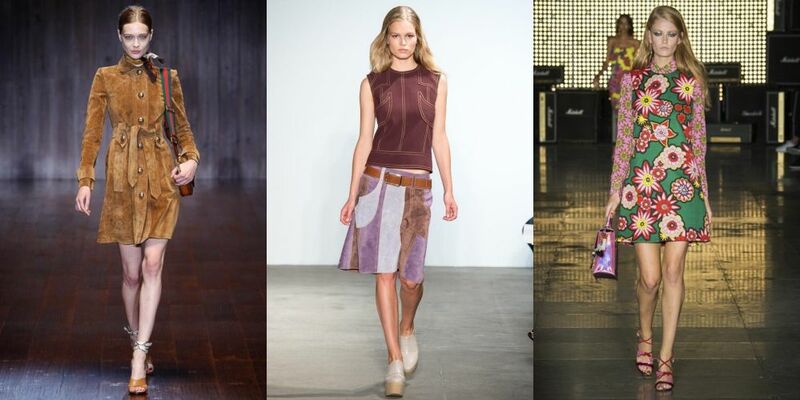 Will you be wearing the seventies trend this Spring?